This was a 27 year old lady , primi , sent for second opinion about placenta. She had a normal 1st trimester scan report done around 13 to 14 weeks . 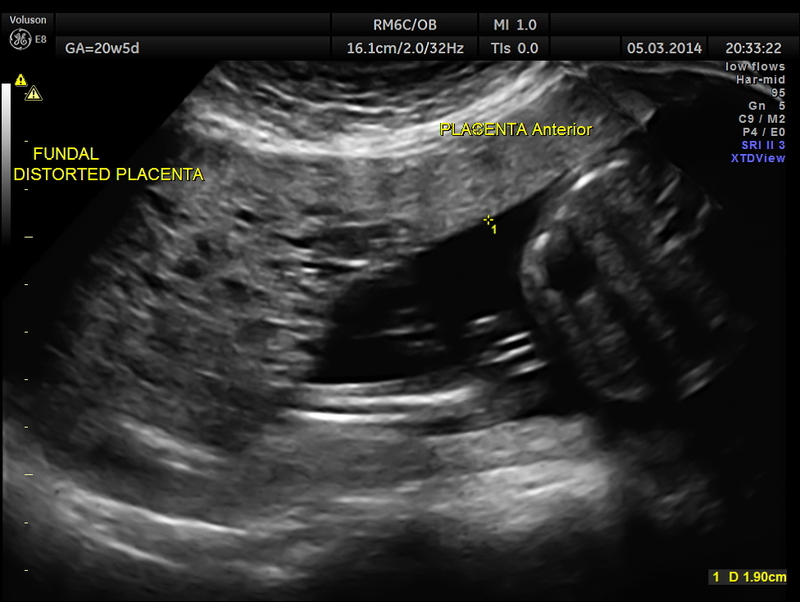 The placenta was reported as normal and the accompanying picture appeared normal. This was done at another centre. 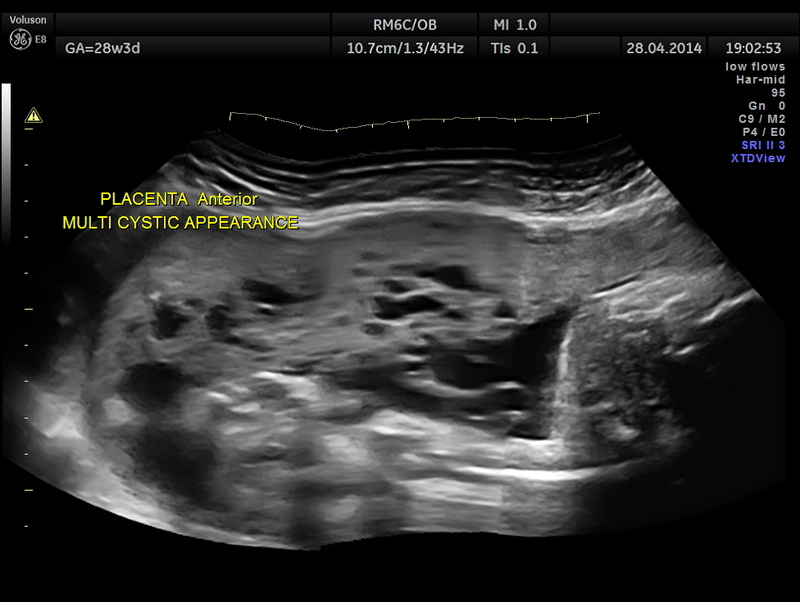 The next scan was around 20 weeks , when the placental abnormality was noted and she was sent for a second opinion. 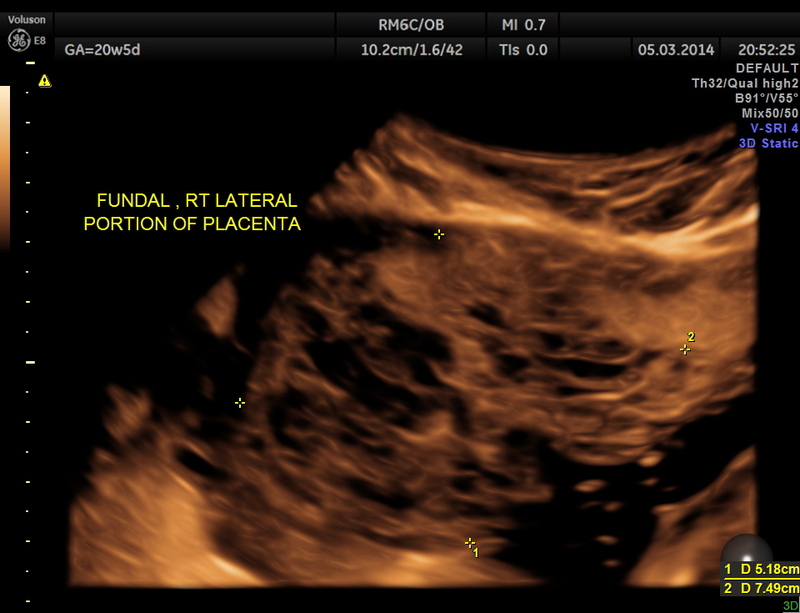 The placenta was on the anterior wall and the scan showed a distinct mass lesion in the antero right lateral portion. 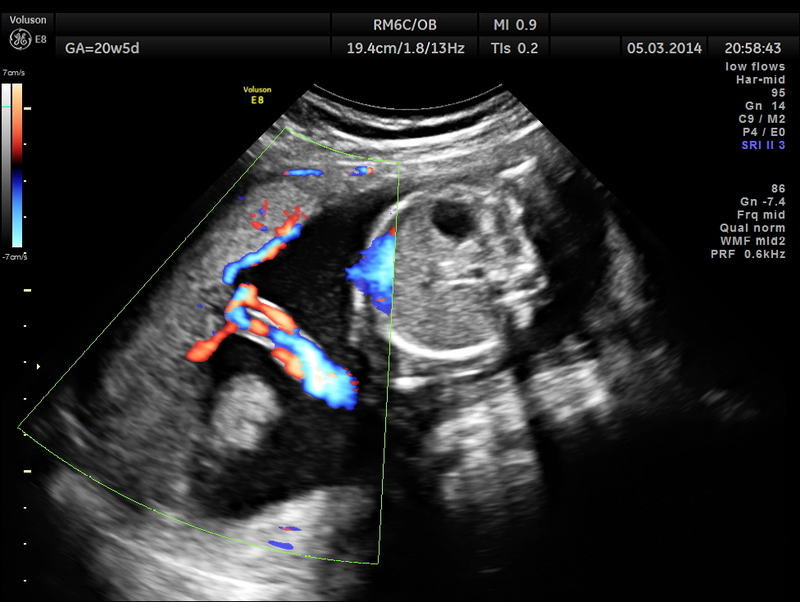 The placenta had multiple small cystic appearance in the right lateral aspect . 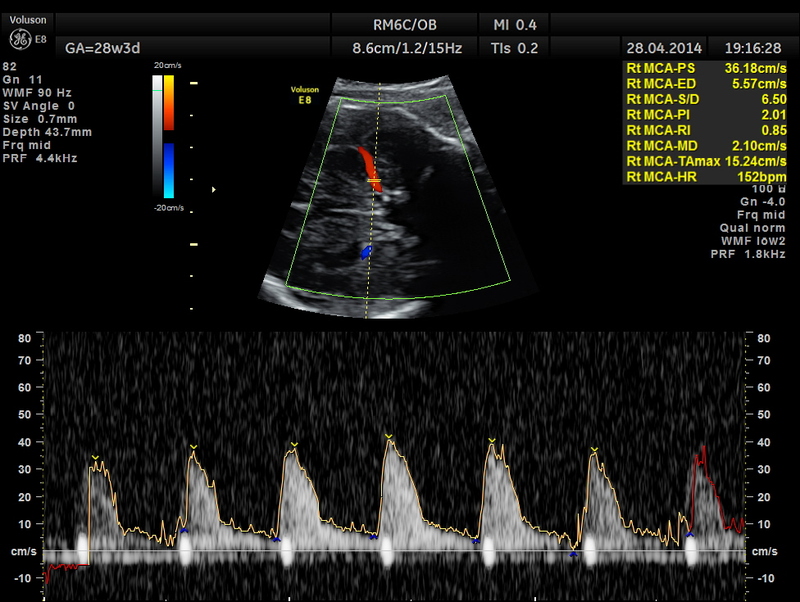 Colour doppler showed no increased vascularity. 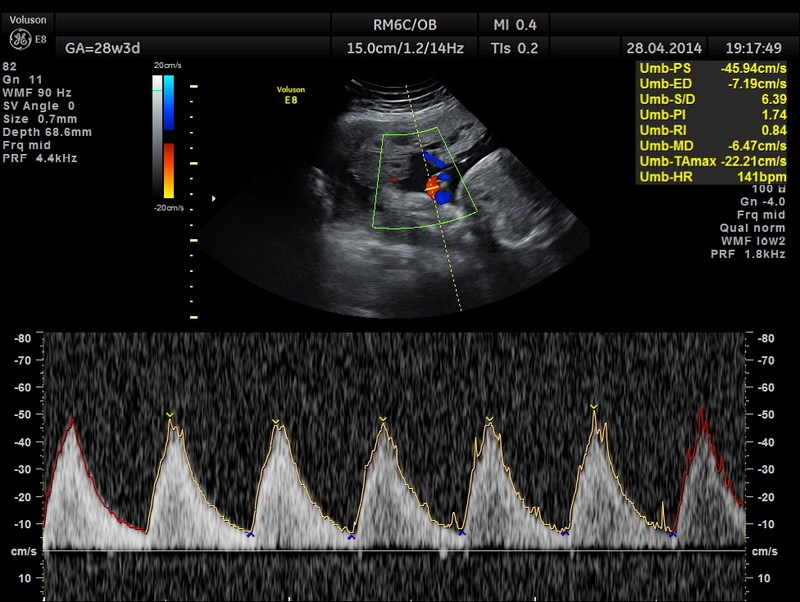 Umbilical artery doppler appears to be normal for the GA.
Cord insertion seems to be at the junction of the normal and abnormal regions. 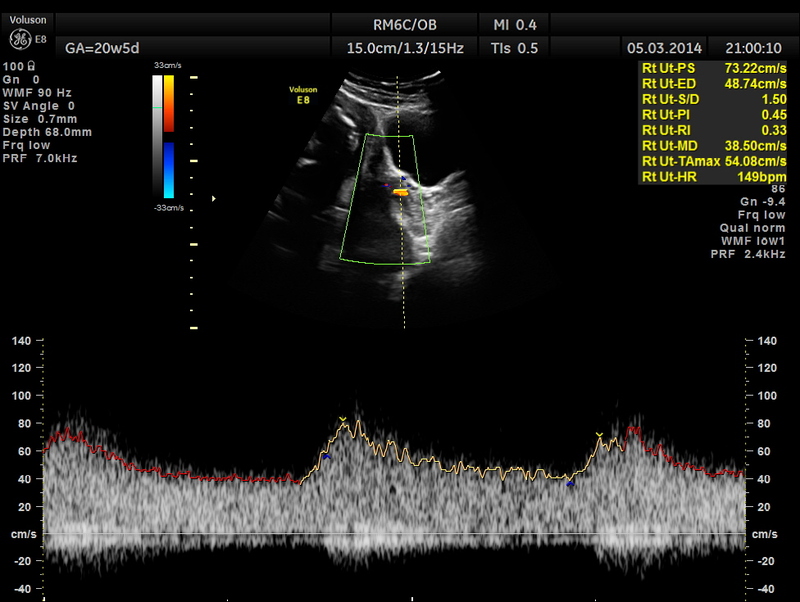 Uterine arterial doppler values appeared to be normal. All other findings appeared to be normal. In the earlier report , it was suggested as a possible partial vesicular mole or a placental dysplasia. 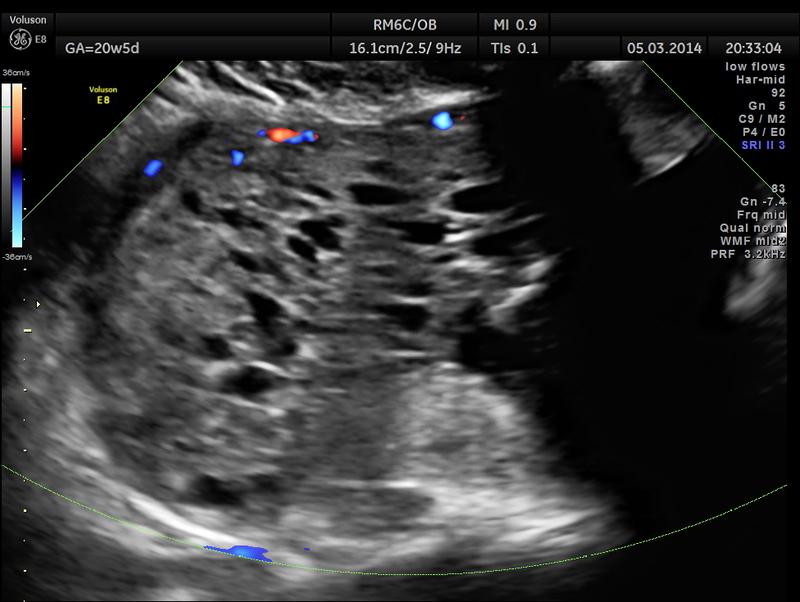 After reviewing the 1st trimester scan report , I felt that vesicular mole was unlikely as it could not have appeared after 14 weeks and gave a diagnosis of PLACENTAL DYSPLASIA with advise for periodic follow up. The patient wanted another opinion and went to the referral centre at Chennai , where they had again given the differential diagnosis of partial vesicular mole or placental dysplasia. The patient was again seen after 2 months , when the findings were very similar. 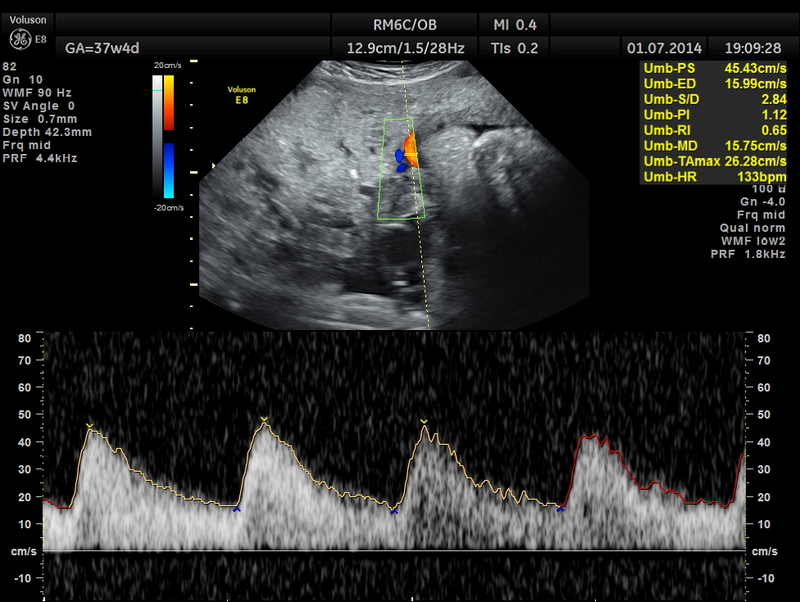 Spectral Doppler pictures are given below. Umbilical arterial arterial P.I. and R.I. are high for the GA. and the cerebro placental ratio appears to be borderline > 1.0 and < 1.1 for the R.I.
She came again after 2 months .The placenta appeared nearly the same , but showed more vascularity. Umbilical artery R.I . AND P.I. appear to be normal now. The cerebro placental ratio is also normal. The patient went into labour a week later and had a normal delivery . 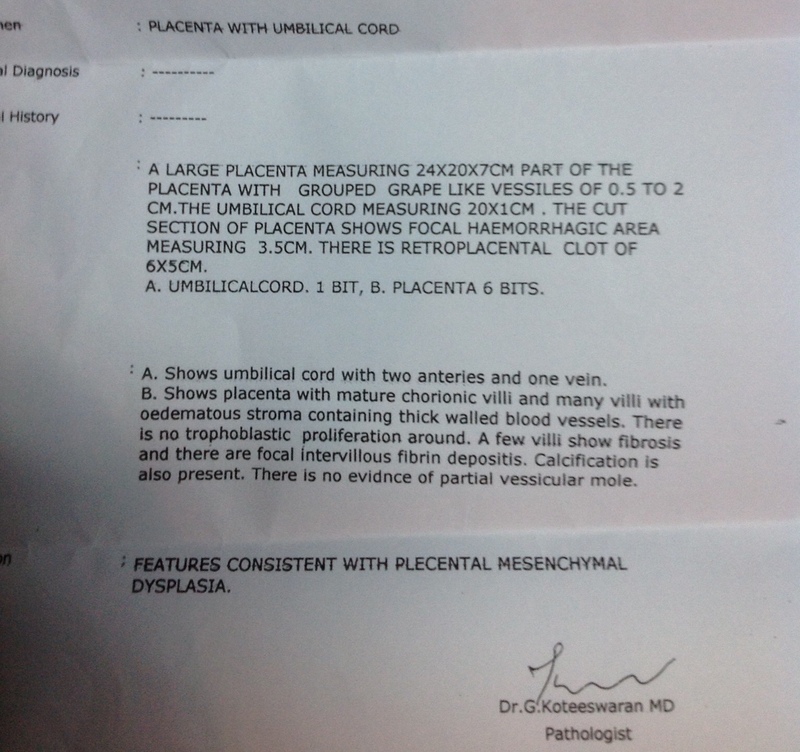 The placenta was sent for histo pathology and the report came as MESENCHYMAL DYSPLASIA OF THE PLACENTA. 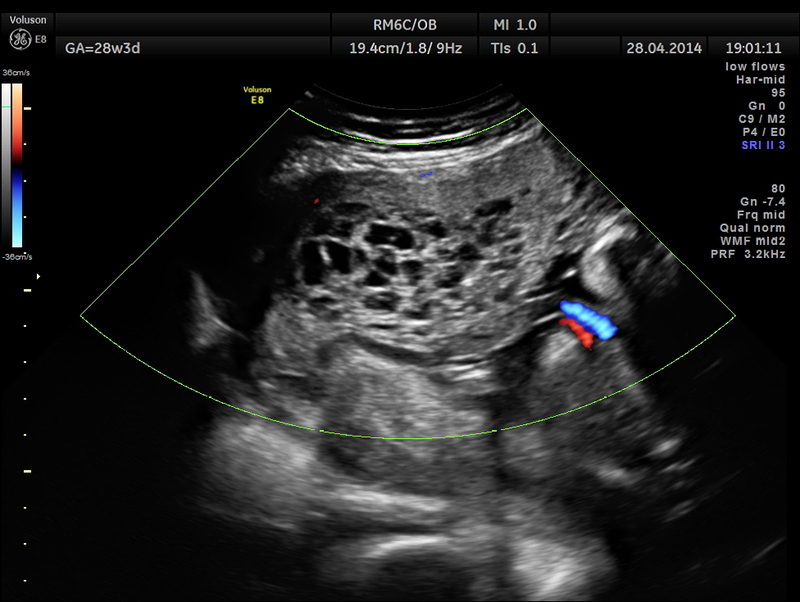 Although PMD may be associated with fetal growth restriction or paradoxically with features of overgrowth, it is important to identify these cases prenatally to reduce fetal morbidity and mortality. It is also important to recognize the detailed gross and histopathologic features of this rare disease entity and be able to differentiate this condition from cases presenting as possible partial hydatidiform moles especially in the first half of pregnancy. 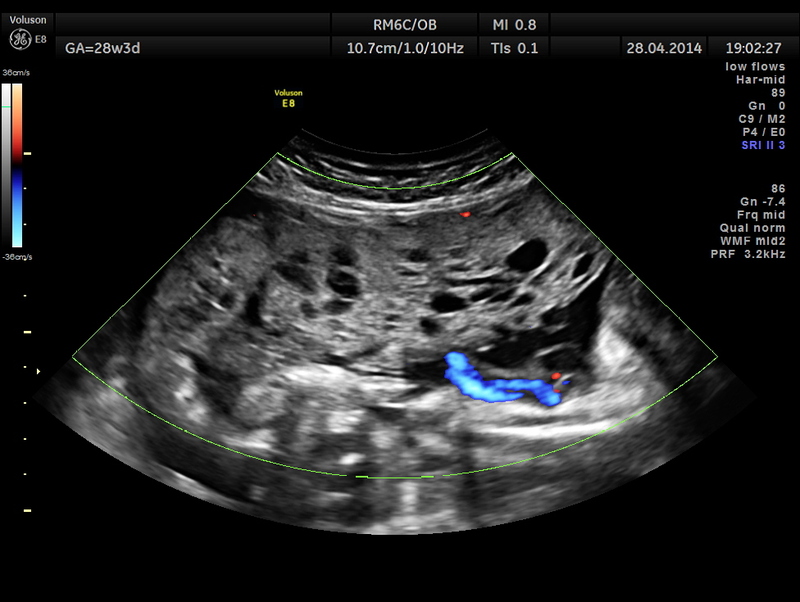 Prenatal recognition of PMD during early as well as late gestation could prevent unnecessary termination of pregnancy. 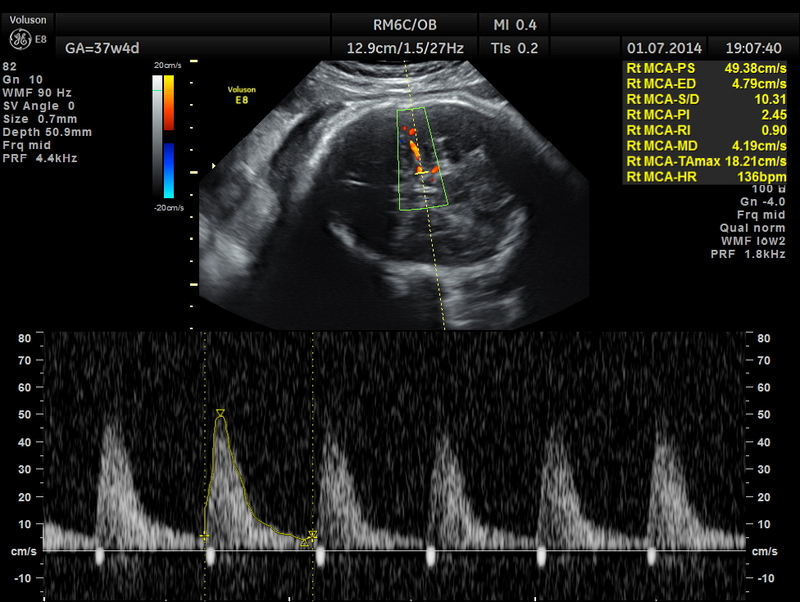 Placental mesenchymal dysplasia in early pregnancy is more likely to be mistaken for a partial mole especially by ultrasonographic examination. 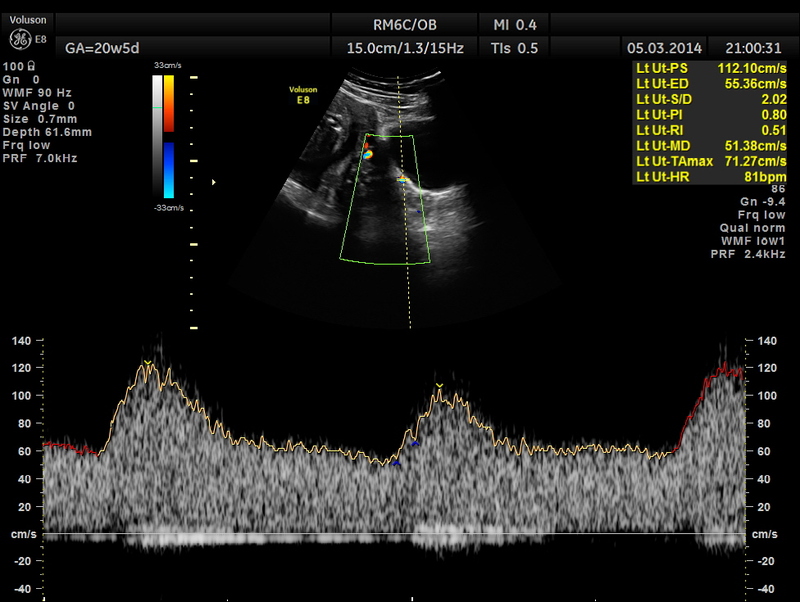 Ultrasonographic findings suggestive of a molar pregnancy because of hypoechoic spaces in the placenta in the presence of an apparently normal fetus, a fetus with growth restriction, or a fetus with features of overgrowth should raise the possibility of PMD. there is something Icannot understand,why could it not be vesicular mole?could you explain please ? 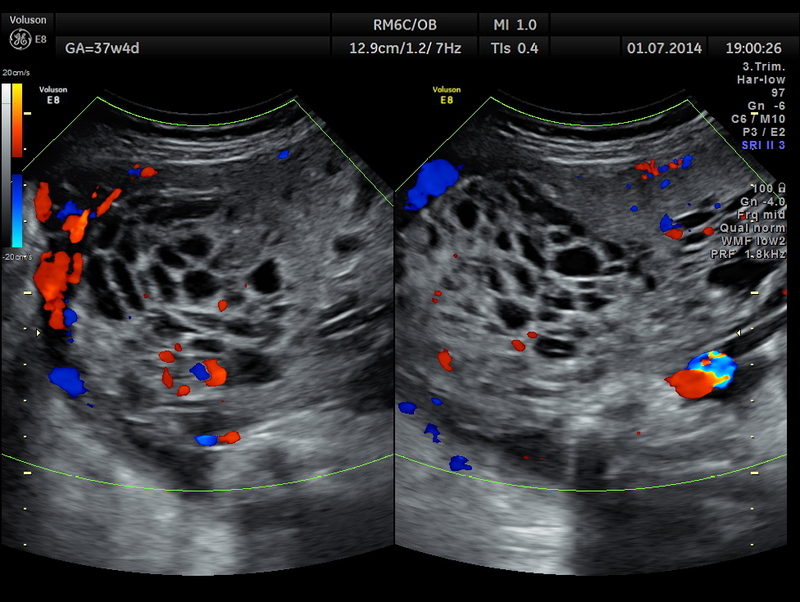 Actually without any previous scan reports , it is very difficult to differentiate . 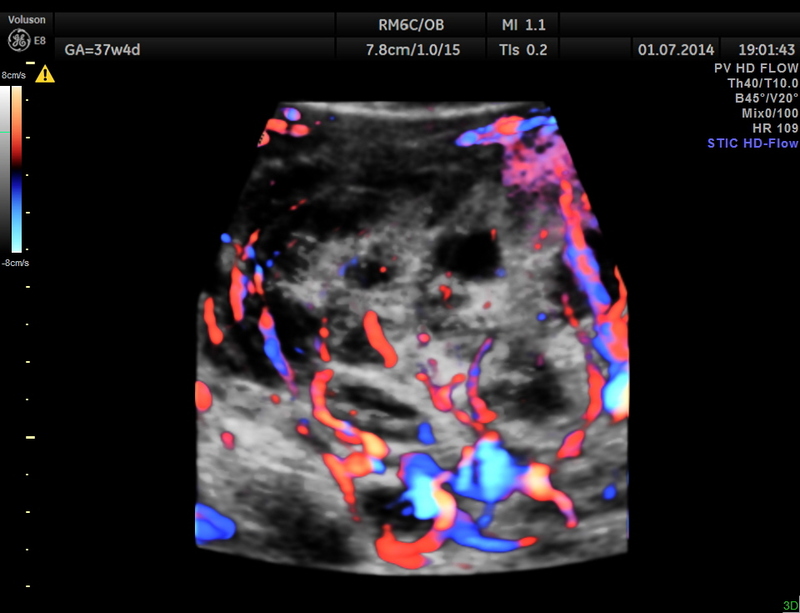 But this patient had a normal scan report done 6 weeks ago and a picture to show the placenta . It is highly improbable for a vesicular mole to have developed after 14 weeks . Very interesting case. I have never seen a patient with PMD. I was very surprised to see a normal fetus with this condition. 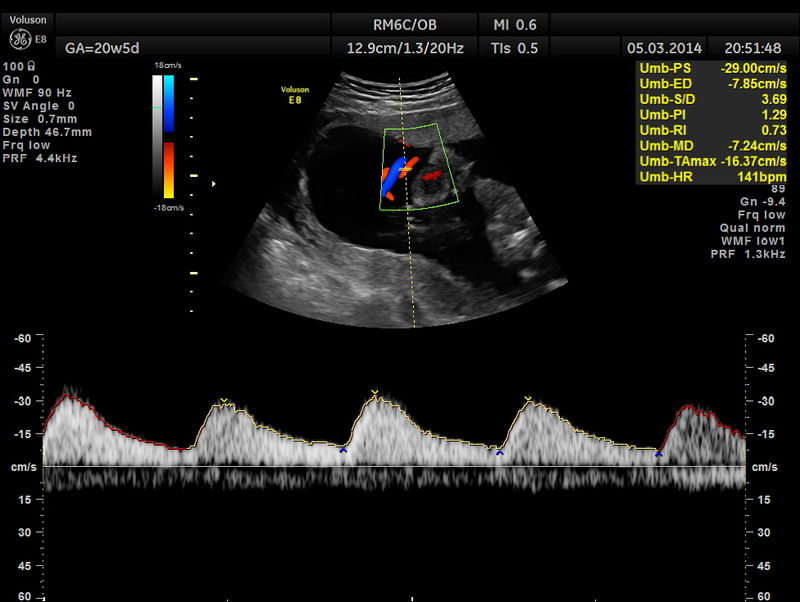 I was also surprised that PMD did not present with the first ultrasound scan. Is this your first scan with PMD? 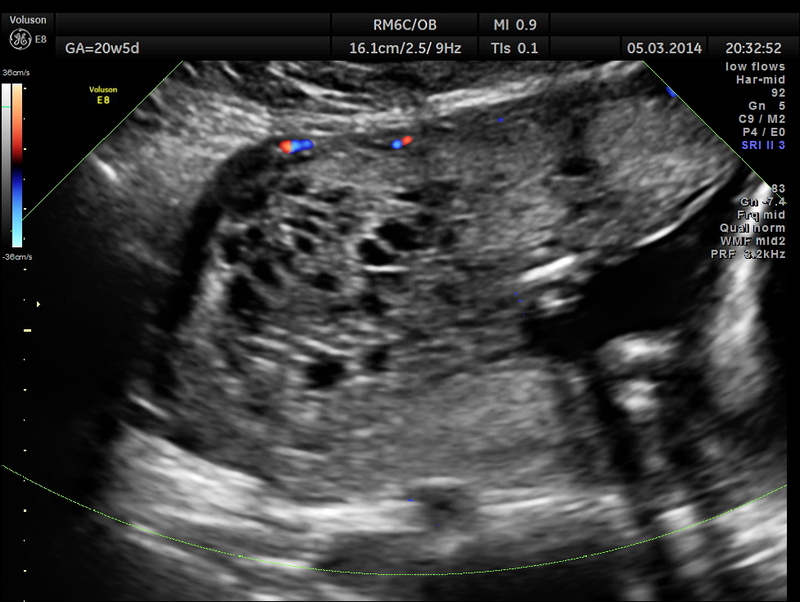 If not, does PMD always look like a molar pregnancy and develop later on in pregnancy?